"Wonderful crispy onions made from Vidalia® or any good sweet yellow onions. These are famous in several restaurants around the Southeast. A great southern staple. Serve hot for best results. Slice onions as thin as possible. You should be able to see the knife clearly through the onion as you slice it." Pour buttermilk into a bowl. Place onion slices into buttermilk, cover the bowl with plastic wrap, and refrigerate for 1 hour. Heat oil in a deep-fryer or large saucepan to 400 degrees F (200 degrees C). Whisk flour, cornmeal, salt, black pepper, cayenne pepper, and paprika together in a bowl. Working in batches, remove onions from buttermilk, letting any excess liquid drip off, place onions in flour mixture and toss to coat. Shake any excess flour mixture off onions. 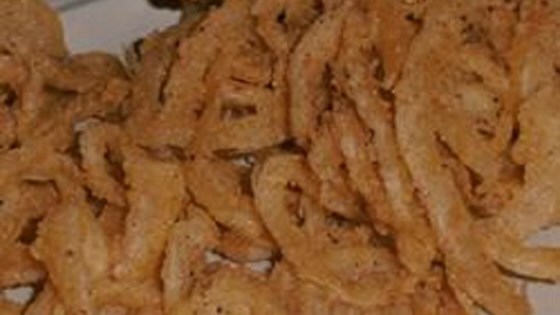 Cook onion rings in the preheated oil until golden brown, 3 to 4 minutes. Transfer rings with a slotted spoon to a paper towel-lined plate to drain. Substitute 2 cups of 2% milk with 2 teaspoons of white vinegar for the buttermilk. It was good, although I did end up substituting some spices. All in all, I would recommend not putting in nearly so much salt as the recipe calls for, because it leaves a very salty aftertaste. Very addicting couldn’t stop eating. Did not have any cornmeal, but these turned out great. Served them up at a July 4th party and they were a big hit.